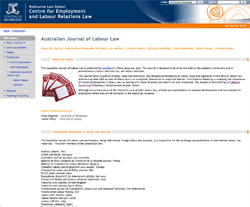 The Australian Journal of Labour Law is published by LexisNexis in three issues per year. The Journal is designed to be of service both to the academic community and to practitioners in labour relations law and labour relations. Australia’s leading journal on labour law and related topics covers issues from each State as well as some international developments. The contributors are all experts in their own fields and bring a variety of expertise and insight to topics such as enterprise bargaining, legislative reform and unfair dismissal. The Journal seeks to publish articles, notes and comments, and detailed commentaries on recent cases and legislation in the field of labour law. Articles may deal with an area of labour law in an analytical, theoretical or empirical fashion. Contributions detailing or analysing the importance of recent developments in labour law, or dealing with issues of policy and reform are also welcomed. The Journal is controlled by an Editorial Committee following a formal process of peer review. Although the primary focus of the Journal is on Australian labour law, articles and contributions on overseas developments will be accepted for publication where they are of wide general interest, or of relevance to the Australian situation. An overview of recent and archived articles published in the Australian Journal of Labour Law is available by clicking on the links below. For further publication information and full text subscription to the Journal, visit the LexisNexis website. The Journal seeks to publish articles, notes and comments, and detailed commentaries upon recent cases and legislation in the field of labour law. Articles may deal with an area of labour law in an analytical, theoretical or empirical fashion. Contributions detailing or analysing the importance of recent developments in labour law, or dealing with issues of policy and reform are also welcomed. The Journal is controlled by an editorial board following a formal process of peer review. Although the primary focus of the Journal is upon Australian labour law, articles and contributions on overseas developments will be accepted for publication where they are of wide general interest, or of relevance to the Australian situation. All article manuscripts should be emailed as a Microsoft Word document to an editor or to law-ajll@unimelb.edu.au. Case notes and other short pieces should be emailed direct to the appropriate section editor. Electronic submissions need not be accompanied by paper copies. Each manuscript should have a title which is both succinct and descriptive. An abstract of no more than 150 words must be supplied at the beginning of each article. The abstract should briefly outline the structure and content of the article and summarise its conclusions. These should be numbered consecutively throughout and appear at the foot of the page. All bibliographical details, case citations etc should be contained in the footnotes and not in the text. Footnotes should not be used to make substantive points. The full citation of a case should always be used when a case is first mentioned, e.g. Smith v Brown (1983) 6 ALR 100 or Smith v Brown  2 All ER 100. Note that full points should not be used. Media neutral citations, where applicable, should be included. Where a case is mentioned frequently it may be given an abbreviated title, e.g. Smith’s case. Page references other than to the initial page in reports are preceded by ‘at’, e.g. Smith v Brown  2 All ER 100 at 106, or at 106-7. A reference to the footnote of the initial citation may be used when subsequently referring to a citation, e.g. above n 3, at 108. Initial references to books are as follows: E Sykes, Labour Law in Australia, Vol 1, Butterworths, Sydney, 1980, p 2. Subsequent references should appear as: Sykes, above n 3, p 43. R R S Tracey, ‘Individual Rights in Industry’, in D W Rawson and C Fisher (Eds), Changing Industrial Law, Croom Helm, Sydney, 1984, p 10. Initial references to journal articles are as follows, M Christie, ‘Legal Duties and Liabilities of Federal Union Officials’ (1986) 15 MULR 591. Page references other than to the initial page are preceded by ‘at’ eg, ‘591 at 594’. Note that journal names and abbreviations should be italicized. Subsequent references should appear as: Christie, above n 5, at 594. Initial references are to short title, for example, Conciliation and Arbitration Act 1904 (Cth). Subsequent references may be descriptive, for example, Conciliation and Arbitration Act. Capital letters should be kept to a minimum and used primarily when referring to proper nouns eg, Supreme Court of NSW or the Human Rights Commission, and thereafter, e.g. court, commission. Authors are requested to supply details of their full name, academic qualifications and current position as part of the first footnote. For spans of numbers use as few figures as possible, but do not abbreviate numbers between 10 and 19 eg, 28-9, 230-1, 340-51, but 10-11, 214-215. Authors are advised that the preferred language style is gender-neutral plain English. Latin and foreign phrases should be kept to a minimum and not used where an English-language alternative is appropriate eg, ‘above’ rather than ‘supra’. The use of graphics, tables and flow charts should be kept to a minimum.